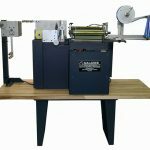 Hot Stamping is an industrial printing process that is commonly referred to as: foil stamping, hot foil stamping, gold stamping, gold blocking, dry stamping, imprinting and embossing. A popular example of hot stamping is the hologram that can be located on credit cards, debit cards and other security related items and documents. 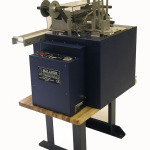 Hot stamping is also found on ribbons, awards, poker chips and other promotional items. HOW DOES HOT STAMPING WORK? The hot stamping process involves a heated metal die, colored foil and a desired product to have a stamp printed. The metal die is heated and pressed against a colored foil that touches the desired product. The foil graphic is permanently transferred to the desired product where the raised surface on the die touches the foil that pressed on the product. Malahide model specific: Malahide by Spartanics Resources Page. 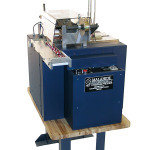 Basic components and operation information: Hot Stamping Applications Page. For more information on how Spartanics can provide a solution for your specific needs, please contact us by filling out our ‘Contact Form’ or call us today +1 (847)394-5700.